I admit it: As I scanned Symantec's opening letter I laughed out loud...and so did the next two guys I showed it to. 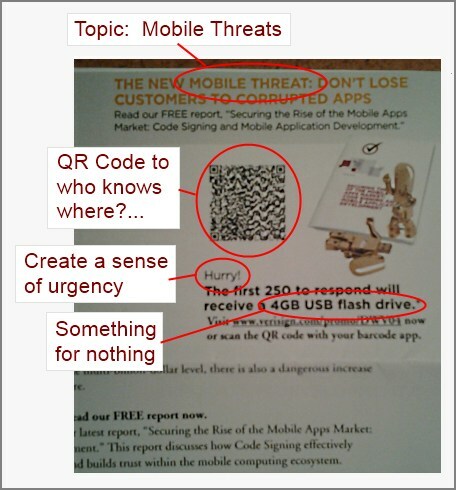 The upper-right corner included an attention-getting graphic and come-on for a free report and a free USB flash drive. In a mere 3"x3" space a leading security company promoted their mobile app security product by prompting me to indulge in a well-recognized mobile security risk. The (sometimes) convenience of a QR code is appreciated but in general QR codes are even less trustworthy than bit.ly addresses. Who knows where you'll end up or what web browser exploits will be waiting there? Thanks but no thanks. If the end user has enough time to think about it the user may figure out that the action asked for may not be worth the risk. You may argue that, since the letter is from Symantec, I can trust the content. I'll point out that there is no reasonable way to verify that this specific mailing actually is from Symantec. Emails are faked - why not snail mail? While I absolutely believe that the letter is legitimate, I can't help but wonder how a company pushing the merits of its mobile authentication system would lead off their contact letter by encouraging customers to overlook a known mobile security pitfall. and occasional attempts at geeky humor. and anything else involving tech. soccer dad, occasional public speaker. Someone else is squatting on the "ATXGeek" handle on Twitter so I'm "esmamlin" instead.